Trap In A Duel To The Death! If this mountain smelled more like wolf than bear, I'd feel more like fighting. This is the first episode in which Kagura is introduced. The Japanese voice actress for Kagura also did the voice for the Praying Mantis demon in episode 28. 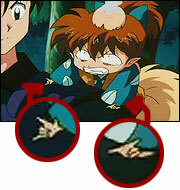 …Shippo making a 'I love you' handsign after he was thumped by Inuyasha? In KAE's hut. SHI is lying on his stomach, drawing with crayons. KIR looks on beside him. KAG looks at the drawings that SHI did in the previous episode. KAG: Did you draw these, Shippo? You're very good. (flips to another drawing and laughs) Oh, what a cute cat! SHI: That's you, Kagome. See the resemblance? Cut to close-of drawing of KOG lying in KAG's arms and INU looking on, holding a wooden plank threateningly. KAG: W-wait a minute, Shippo! Have you shown this embarrassing play to anyone else? SHI: I showed Old Kaede. (smiles happily) She complimented me that it was well done. KAG: (embarrassed) Old Kaede…knows the reason why I fought with Inuyasha? Cut to SHI standing on a fence, showing his drawings to the horde of villagers around him. SHI: (voice-over) Not only Old Kaede. I wanted everyone to praise me so (zoom out to reveal the entire village crowding around SHI) I showed them all in the village. What about it? Cut to flashback of episode 37, where KOG professed his love for KAG. KOG: It's not a lie! Kagome is my woman! I love Kagome! KAG: (voice-over) The Wolf-Demon Tribe… I met Koga when we encountered the Birds of Paradise, who tried to take the Sacred Jewel fragments. Cut to flashback of previous episode, where KAG dined with her friends at Wacdonald. Yuka: Do you love this fellow? KAG: (thinking) Huh? Love? I love Inuyasha? In the mountain hideout of the Wolf Demon Tribe. At a waterfall, GIN and another wolf demon are patrolling. GIN: All right, that side was all clear. (looks down) That guy! Cut to HAK napping away by the water. GIN creeps up behind him. GIN: (takes a deep breath and yells) The enemy! HAK: (gets out of the water onto a grass patch) Shut up! That was a dirty trick, Ginta! GIN: Only because you slacked off and fell asleep! HAK: Damn… (notices a group of wolf demons walking towards them) They're from the northern caverns. In the hideout behind the waterfall, the wolf demons and wolves gather. KOG leans on a boulder, listening. Northern Tribesman 1: There's someone in possession of a huge Sacred Jewel fragment. Northern Tribesman 2: And he's the lord of some castle! This isn't a joke. Northern Tribesman 1: Let's combine forces, the northern and western caverns and take the Sacred Jewel from the castle. We'll divvy up the fragments equally. Northern Tribesman 2: Well, Koga? Wanna join us? KOG: (closes his eyes) Sorry, but I'm not interested. Northern Tribesman 2: Hey! Why? KOG: I have something else I have to take care of first. Northern Tribesman 1: I see…well, we won't force you. Northern Tribesman 2: Didja see? I think he's injured. Cut to close up of KOG's wound inflicted by the Bird of Paradise in episode 37. Cut to the wolf demons crowding around KOG. Wolf-Demon 1: Are you sure about this, Koga? Turning them down? Wolf-Demon 2: If we don't join them, the northern clan will get all the Sacred Jewel fragments! KOG: Let them go… it doesn't matter. Wolf- Demon 1: Well, I can't! I'm gonna go with them! Wolf- Demon 3: Me, too! KOG: (folds his arms and look away) I'm not interested now. If you want to go, I won't stop you. Wolf- Demon 1: We're gonna join up with the northern pack now. Wolf- Demon 3: (to everyone) Whoever wants Sacred Jewel fragments, join us! Wolf- Demons: (follows them) Yeah! KOG: (looks at the wound on his arm, thinking) Damn…! Cut to flashback of episode 37, the duel between KOG and the boss of Bird of Paradise, the Bird Brothers. KOG: (slamming his spear into Bird Brother's bird mouth) Take that! The Bird Brothers closes its mouth, snapping the spear. KOG's right arm, which was holding the spear, is caught between its teeth. Bird Brothers: First, we'll tear off your right arm!! KOG kicks one tooth and he is released from its grip. However, KOG's right arm is wounded by the grip and when he flies off, the Sacred Jewel dislodges from his arm. KOG: (voice-over) I never expected it that the demon bird would steal my Sacred Jewel fragment from my right arm. I'll get the fragment back in time. But before that came that dog! Cut to INU annihilating the Bird Brothers with the Wind-Scar. KOG looks on in awe. KOG: (voice-over) With that huge sword, he killed the demon bird in one swoop. That guy… I won't be satisfied until I kill him with my own hands! KOG: (thinking) This wound isn't healing as fast as I hoped. Cut to INU-gang moving in a forest. KAG: (pointing) This way, I'm sure of it. I got a sense of Sacred Jewel fragments. MIR: We really need Kagome, after all. SHI: (on MIR's shoulder) She's the only one who can sense the Sacred Jewel. MIR: Yes, so Inuyasha, don't fight with her anymore. SHI: (shouts at INU) Do not fight! SAN: A demon bear that terrorized the village. Cut-scene of huge bear prints on the ground, several villagers looking at it. MIR: (voice-over) That's what the villagers said. At first, it was just a mischievous bear ruining the fields. Suddenly, it grew huge and attacked the village. MIR: Inuyasha? You seem displeased. INU: Of course! Sure, it's important to search out the Sacred Jewel fragments that Kagome senses. But rather than a bear, I'm searching for a wolf! INU: We know that that skinny wolf-demon Koga still has two Sacred Jewel fragments in his legs. (sniffs the air) If this mountain smelled more like wolf than bear, I'd feel more like fighting. MIR: So you want to say that butchering Koga comes first with you? SHI: Koga, his love rival? Loud thump is heard. Cut to SHI with a huge bump over his head. SHI shrieks in pain and falls off MIR's shoulder. Cut to MIR and INU looking at SHI. INU has his fist raised. SHI: (literally fuming) What're you doing?! INU scoffs, looks away and folds his arms. MIR: (kneels and whisper to SHI) Shippo, you don't bug Inuyasha and you won't feel his fist. Rustling sounds are heard among the bushes. The group looks back to find a group of mercenaries with swords in their hands, smiling evilly. MIR: Don't worry. They ordinary mercenaries. Mercenary 1: (walks a few steps closer) Ordinary?! You're pretty cocky, kid! From the looks of you, you have no money. Well then, you can leave the women. INU: Hey you… I'll give you a good piece of advice. If you don't want to get hurt, better run away. SAN tugs at her HIR. Mercenary 2: What?! How dare you! KAG: (takes a step back) Yes! I can feel the Sacred Jewel coming closer. SAN: (takes HIR) Get back! Suddenly the ground shakes and loud noises are heard. Cut to bird's eye view of the forest, where birds flock away hurriedly. Cut to close-up of a bear paw crushing downwards. Cut to a tree trunk rolling quickly from behind the mercenaries, who dodges. SAN swings her HIR which slashes the trunk into two, thus saving the group. A gigantic bear emerges from the forest and growls. The mercenaries flee hurriedly. The bear trudges towards the group. KAG: It's in his forehead! The Sacred Jewel fragment! The poison insects attack the bear, who growl in pain. One of the insect take the jewel from the bear's head. INU: They're taking the Sacred Jewel fragment! The bear growls and falls to the ground. Its body is disintegrated into bones. The insects fly away. MIR: Is it a trap? INU: Fine with me! This time, Naraku won't get away! Nighttime in Naraku's castle. A woman walks along a corridor slowly. She stops in front of a room. Cut to exterior of castle. The wolf-demons gather. Northern-Tribesman 1: Here it is…the castle full of Sacred Jewel fragments. When the men of the castle appear, never mind! Just kill them all! Wolf-Demon: (raise their weapons and yell) Yeah! Wolf- Demon 1: (looks around apprehensively) What's this castle? They don't even have guards posted. Wolf- Demon 2: There's someone! The woman appears behind a screen. Wolf- Demons: (runs and throws their weapons at her) Go! Get 'im. The woman doesn't flinch. She raises her fan, opens it and swings it at the Wolf Demons. A strong gust of wind appears and blows them into the air. Woman: What? Only small fry. (walks a few steps to the remaining demons) Get him. (raises her fan again) Someone more virile. She swings her fan and blades of wind fly towards the demons, cutting them. Shrieks of pain are heard. Nighttime at the waterfall. HAK is patrolling with two wolves. He yawns and reaches GIN, who is lying on a rock, sleeping. HAK sniggles and the wolves make some whining noises. He kneels and makes a 'quiet' finger at them. He tiptoes towards GIN. The wolves growl. Someone appears behind. HAK turns back. It is Wolf-Demon 2. He struggles and makes groaning sounds and tumbles forward. HAK yells. GIN: (suddenly wakes and grabs his spear) What's up! At the hideout, the wolf demons crowd around Wolf-Demon 2. Wolf-Demon 4: What's the matter? He went with the northern pack! KOG: (rushes forward, worried) Hey, what's wrong? What happened? KOG: It's a Sacred Jewel fragment! Wolf-Demon 5: (weakly) Hurry to the castle! If you don't, everyone will be killed. HAK: (reaches Wolf-Demon 2) Let's rest inside. GIN: But you… How did you make it back here with those injuries? GIN pats Wolf-Demon 2 on the back gently. The Wolf-Demon 2 yells in pain and foam emits across his chest. His body breaks into two and falls onto the ground. The Wolf-Demons yell. At NAR's castle. The insects return and INU-gang followed them. SAN: Wolves… Could they be wolf-demons? Cut to the woman inside a room. She raises her open fan slowly and swings it. A gust of wind appears and blows towards the dead Wolf-Demons. They wakes and struggles to get up. SHI: What's that? They're still alive! MIR: I don't sense any life in these men. The Wolf-Demons trudge toward the group and attacks them. The group retaliates. MIR: You see? Even if they're put down, they revive immediately! The fallen Wolf-Demons get up. SHI: They're supposed to be dead! How come they keep coming back alive! Cut to woman in room. Woman: You can't cut them nor can you beat them. And if you lop off their heads, they'll reattach right away. This is my Death Corpse Dance. (notices something) Oh? Here already? Cut to KOG running. Back to woman. Woman: I wanted to play a bit longer. The woman closes her fan and the bodies of the Wolf-Demons falls apart. Blood from their bodies gush onto INU's clothes and hands. INU: (looking at the blood on his hands) W-what's this?! The bodies of the Wolf-Demons fall one by one. SHI: What now? They're all collapsing! KOG reaches the castle and lands on the roof. He surveys the scene and gasps in horror to find his tribesmen dead around INU. MIR: That's Koga of the Wolf-Demon Tribe! KOG: Inuyasha! How could you by so cruel!? INU: Let me tell you one thing! When I got here, your comrades had all been killed! KOG: Shut up! You're covered head to toe in blood! You can't lie to me! INU: (looks at the blood on his hand, thinking) Damn! It was a trap! KAG: Koga, you're wrong! We came here looking for someone named Naraku! Then…! KOG: Kagome! Don't try to protect such a guy! You cur! Dead when you got here? That's bull! MIR: We were trapped! It's Naraku's trick! We followed Naraku's poison insects to this castle. The wolf-demons probably followed some clues here, too, then were killed. SAN: And Koga arrives to save his comrades. Only to find Inuyasha covered in their blood. KOG grinds his teeth and glares at INU angrily. MIR: The wrath of having his comrades killed won't be quelled. They will fight to the death. SHI: The blood has gone to Koga's head! As it is, they really will fight to the death! KAG: (thinking) I have to stop them… But…but how?! KOG jumps at INU, who dodges. He crushes the ground instead, which causes a long split in the ground. Some broken pieces of the ground hit INU. INU: (thinking) His arm's gotten stronger! (lands) Koga! You found another Jewel fragment for your arm!? KOG: You stole my fragment the last time we met. This one's even better! A red glow emits around KOG's arm, where the new Sacred Jewel is. KAG: That glow! It's not the light from the Sacred Jewel! It's black and the glow is warped! What is that fragment?! KOG attacks INU several times angrily, who dodges. KAG: (yells) Stop, Koga! Please! Listen to me! This is a trap! The one who killed your friends is not Inuyasha! KOG: Shut up! I only believe what I see with my own eyes! INU: Stop, Kagome! This hard-headed punk can't understand complicated things. Fools like him can only be tamed with brute strength! KOG clenches his fist and grinds his teeth angrily. SHI: The Wolf-Demon Tribe lives in packs and cherish their comrades. Seeing so many killed at one time, Koga's wrath won't be easily controlled! MIR: I thought he'd listen to you at least, Kagome. SAN: I can't blame Inuyasha…since Koga is attacking him. There's no choice but to stop him with a duel. INU: (thinking) Naraku is trying to make me fight Koga. And he's watching us from somewhere. (looks around) Inside the mansion? I can smell Naraku! SAN: What'll we do? Shall we help him? MIR: Inuyasha was looking for Naraku, the one who laid the trap. SAN: Then is he…inside the mansion? HIR lands inside the mansion. SAN and MIR reach inside. They look around apprehensively. The woman appears behind a screen and they run towards her. MIR: Who are you? What're you doing here?! Woman: My name? I am Kagura. She's Sango… and you're Miroku, right? Kagura abbreviated as KAR from now onwards. MIR: (raises his staff defensively) Naraku's agent! Tell us! Where is Naraku?! A wooden thing falls onto the ground. It is the thing used to control NAR's puppets. KAR: Now then… I'll go see what's going on outside. Koga and Inuyasha, huh? Not my types at all…so I don't care which one dies.